Injectable parasiticide for the treatment and control of internal and external parasites of cattle, swine, reindeer and American bison. Can only be sold to US addresses. Restricted drug in California. A Parasiticide for the treatment and control of internal and external parasites of cattle, swine, reindeer and American bison. Cattle Dosage: 1 mL per 110 lb. body wgt. 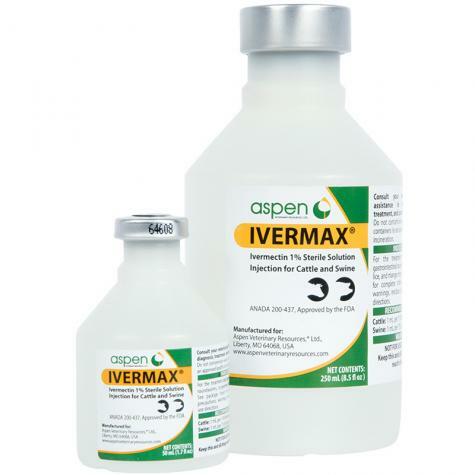 For the treatment and control of gastrointestinal roundworms (including inhibited Ostertagia ostertagi), lungworms, grubs, sucking lice and mange mites in cattle. Swine Dosage: 1 mL per 75 lb. body wgt. For the treatment and control of gastrointestinal roundworms, lungworms, lice and mange mites in swine. Withdrawal prior to slaughter—35 days (cattle). Do not use in female dairy cattle of breeding age and do not use in calves to be processed for veal. 18 days (swine). Read all warnings and cautions on label. For vaccinating sheep, goats, swine, & cattle. 50 ml capacity. I received this very quickly! Nice service. Will order from Premier1 again.